Our Glass Fibre Composite (GFC) Grit Bin is the toughest available and is manufactured with a lightweight core encapsulated in 20mm high impact strength glass fibre composite. With a capacity of 336 litres (336kg) this bin is popular among councils and local authorities. It comes with an optional factory-fitted hasp and staple to offer added security. Tough, hard-wearing and vandal-resistant, our range of GFC grit bins are ideally located in residential areas, schools, colleges, car parks and by the roadside. They are also unaffected by extreme weather which makes them suitable for outdoor environments year-round. 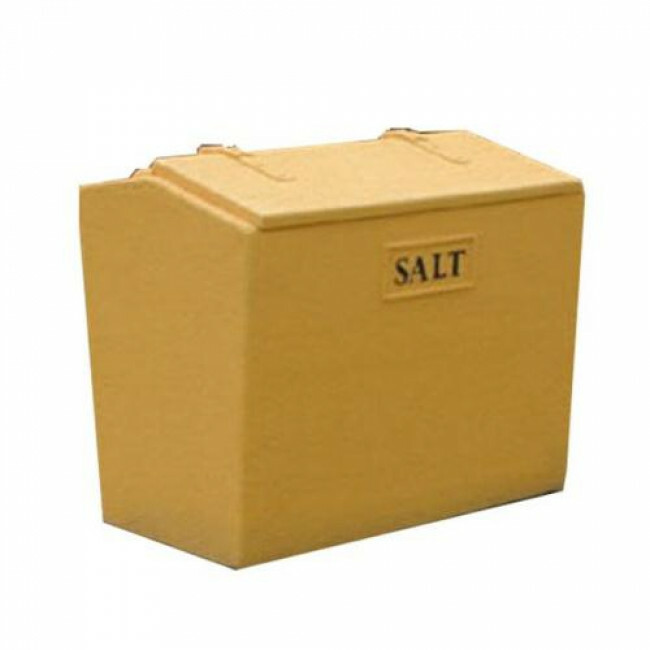 This bin is available in yellow, black or green and features a hinged, lift-up lid that allows for easy access. We offer the option of either textured or smooth finish (at an additional cost) and an open or closed front (also at an additional cost).The open front allows for easier access to the grit with a shovel than the top opening. There is also an additional option of including forklift runners into the design - these allow the bin to be easily manoeuvred even when full of rock salt.